Glo-minerals makeup for a polished dewy finish for your bridal photos. Nothing is more important that how your entire hair, makeup and dress look the day you are to be married to your love. Your photos last forever and you these as keepsakes. Having a professional makeup artist ensures that your bridal makeup is perfect for your skin tone, the day or evening wear for the setting at your ceremony. We suggest a practice run to review your makeup colors, your trail up do to make sure you love your choices. Having your bridal makeup done allows you to look at yourself the way you want to look. This also gives you the opportunity to change your mind on any part of your ensemble. When we do this before your wedding, we recommend that you bring your hair piece to make sure the lighting sets off your hair and makeup. Your skin tone is not complete without having the right finishing powder to set you rmakeup. Allow 1 hour for a bridal makeup trial run two weeks before your wedding. We can do your bridal makeup for the rehearsal, the day you try your gown on, the day of the wedding. Schedule your wedding makeup in the morning vs later in the day. This allows the makeup to set. We can add on cluster lashes for a fuller effect, corner lashes or clusters. Setting up a consultation prior to the day of the wedding is recommended two weeks prior to get used to the eyelash extensions. They really enhance the eyes and make such a big difference. Waxing should be done at minimum 7 – 10 days prior to prevent breakouts. See our waxing services for full face, body, bikini and brazilian waxing. 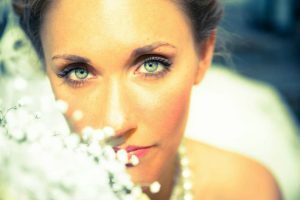 Wedding makeup is $65.00 for a one on one session. Please bring your favorite colors if you have a certain color for your wedding day. Book online here for makeup services, preliminary bridal hair and waxing services. With the emphasis on wellness in everything we do, Indulge Salon is proud to feature Glo-minerals makeup. At Glo, the company sees makeup as an extension of skincare. Each product category makes up the foundation of the Glo -minerals application steps that builds on each other. 4 easy steps to flawless skin. Active ingredients that are in proper concentrations deliver skin transformation. Glo-minerals is passionate about what is not harmful in the makeup and is very concerned about delivering products that make you look and feel your best for a polished glow, naturally. Glo-minerals products are never tested on animals and our line of mineral makeup is PETA approved. Skin nourishing mineral makeup covers, corrects and protects. It’s uniquely designed for skincare professionals and our clients. Award winning formulations deliver unsurpassed coverage, UV and environmental protection and exceptional spectrum of mineral pigments. Talc-free and non-comedogenic, glo minerals provides the ideal choice for even sensitive skin. Coverage that lasts. We use only the fineset ingredients and ultra-fine minerals in a triple milled process ensuring that every application provides even, continuous coverage. Antioxidant Blend foundation bases contain a proprietary blend of Vitamins A,C,E, and Green Tea Extract for nourishing environmental protection. Color Palette has a rich spectrum of mineral pigments allowing for a vriety of color statementss. Sensitive Skin loves this talc-free, non-comedogenic, iinfused with anti-inflammatory ingredients to improve the appearance and condition of acne and redness-prone skin. Face Primer creates an even, ideal canvas for foundation by filling in the fine lines and large pores so that the foundation goes on smooth as silk. the result is skin looking procelain smooth. Under Eye Primer is an anti-aging under the eye primer that minimizes the appearance of imperfections by filling in fine lines while using light-reflective pigments to soften the appearance of wrinkles and dark circles. Lid Primer prevents oil from interfering with eye makeup application and neutralizes lid tones allowing for ore vibrant color adn extended wear. Sheer Tint Illuminator is a sheer light -reflecting formula that illuminates skin tone creating a healthy glo. TINTED PRIMERS SPF 30 is a silky, oil free, tinted primer with pure mineral sun protection glides on to instantly even skin tone, mask imperfectios and provide all day coverage. Wear alone for sheer radiance or prep foundation for a flawless complexion. This is the lightest, sheerest foundation that I’ve ever used in any makeup line to prepare the skin. wear alone or under a satin or Luxe foundation. Available in clear to fill in the wrinkles or 4 tinted shades of Fair, Light, Medium and Dark. Pressed Base is the top seller, award winning foundtion delivers unsurpassed coverage that nourishes, corrects and protects. Pressed Base provides buildable, sheer to full coverage with a flawless, semi-matte finish. Good for all skin types. Available in 20 shades. Loose Base is a mineral foundation that is beautifully pigmebted and luminescent. Offers medium to full coverage with a dewy finish and is well-suited for sensitive skin. Best for Normal to Dry Skin types. Available in 9 shades. Sheer Tint Base is more of a delicate sheer camoflaging flaws while nourishing skin to a healthy glow. Good for all skin types. 6 shades available. Protective Liquid Foundation Satin is a buildable satin finish. Can be layered on all skin types except oily skin. Available in 16 shades. Includes dark mocha and espresso skin types. Camouflage Oil Free camouflages blemishes, scarring, and hyperpigmentation and other types of skin conditions. Available in 4 shades. Concealer Under Eye includes dual colors for under eye ingredients to hlep brightne and improve dark under eye circles. Available in 4 shades. Brightener Highlight Concealer is a MUST have under the eye concealer, sides of the nose and anywhere else you want to brighten dark shadows. CORRECTIVE CONTOUR KIT Sheer easy to apply formula that expertly apply neutralizes and conceals skin discolorations. Redness Relief Powder visibly reduces skin redness with this loose powder that contains soothing ingredients like Honey Suckle, Zinc Oxide and Caffeine. Glo contouring palette features four powder shades to enhance features and create dimension. Whether softly subtle or more dramtically chiseled, these blendable and buildable formulas allow you to create a customized contour statement. Perfecting Powder is a clay based pressed formulation that offers a truly translucent natural finish to absorb excess oil and set makeup for all day wear. Matte Finishing Powder is a pressed finish with a natural slight tint to balance color. Loose Matte Finishing Powder is a TRUE translucent loose mate powder that sets the look for all day wear while soaking up oil. Hydration Mist includes a blend of antioxidants to hydrate and set your minerals. Feels light and refreshing. Blotting Papers keeps skin oil free all day. Each book contains 100 papers. Each paper doesn’t disturb your makeup without clogging your pores. Smoky Eye Kit showing a quad of trendy smoky available in both warm and cool shades. Buildable metallic tones from day to night. Eye Shadow Trio contains a perfect trio of base, contour or highlighted shades are available in 6 shades. Elemental Eye Collection of eye shadows are buildable and blendable spectrumof neutrals. Create endless looks with this stunning eight shadow palette. With four warm neutrals and four cool neutrals, this gorgeious collection is sure to become your go to for both day and night. Liquid Ink glides on with pinpoint precision and dries quickly in black. Graphic Liner gives a perfect line with precision liquid. Available in Brown and Black. Jeweled Eye Pencil create the perfect creamy jewel colors color for the base line, crease, and lash line. Cream Stay Shadow that delivers 24 hour cream base , liner in on3. Qfqilqgl3 in 4 shades. Lash Boosting Mascara contains lash conditioners and film forming polymers created for optimum performance in black. Water Resistant Mascara is long lasting, water resistant formulation and conditions and helps strengthen the lashes with Bamboo and D-Panthenol. In Black. Volumizing Mascara gives full, flawless lashes. Plumps and thickens and defines with clump free conditioning. Blck and Brown. Lash Lengthening Mascara is long wearing with a flexible brush to separate and lengthen the lashes. Available in Black and Brown/Black. Lash Thickener & Conditioner that is colorless delivering nutrients to the lashes to keep them healthy prior to mascara application. BROW QUAD is used to fill, shape and dfine the perfect brow with the convenient all-in-one quad. Includes two colors to customize your shade, plus a highlighter and wax. Best used with a spoolie brush and dual brush. Brow Powder Duo offer the perfect duet of colors to achieve the perfect duo to fill in the sparse areas. Brow Gel provides brow sculpting control in tinted or clear and instant coverage for unwanted gray or silver hair. Precision Brow Pencil gives a natural looking brow enhancement that fills, sculpts and shapes brows. Each pencil includes a versatile brow sculpting brush for 2-in-1 shaping and blending. Attached is a spoolie on the end of the brow pencil. Brow Collection inclusive collection offers everuthing you need for brow styling and maintenance. Shimmer brick contains four colors that can be swirled together for a capitivating glo. Brides love GLEAM for their big day for fairy dust! Bronze gives a seamless color enhanceewnt athat adds a warm, natural sun-kissed glo. Highlighter has pink luminescent cream that adds a subtle radiance to instantly brighten the complexion. BLUSH is for the high pigmented color for expert shading and highlighting. Available in 14 shades. Cream blush is formulated for long lasting blush. Availble in 2 shades. Blush Duo was created to highlight and contour cheeks. Blend together for a natural glo. Available in 2 shades. Suede Matte Crayons are saturated, matte redefined, long-wear color provides intense payoff with a velvety sooth finish. This chunky pencil with built-in sharpener delivers precision and convenience in one. Suede Matte Stick – matte defined, saturated, long wear color provides intense color. Comes in a slender stick with creamy application for hours. Cream Glaze Crayon is shine perfection. Electric, high shine color cobines a luxurious glossy look with intense saturation and impressive staying power. Lipstick creams deliver vibrant color with a satin finish. Sheer Lipstick is a moisturizing formula that glides on lips for a sheer pop of color. Precision Lip pencil is a long wearing, water resistant (great for coffee drinkers) used to define lips and keep color in place. Each pencil includes a lip brush for easy blending on the opposite side of the pencil. Precise Micro Lipliner is a long lasting cream lipliner offes a sooth application of rich color. Petite liner that is retractable. Gloss that shines up the lip as it conditions with antioxidants and mineral pigments deliver nourishing color and shine. Liquid Lips deliver high shine, luxurious formulation for an ultra moist look that lasts. Rich nutrients condition and protect the lips. LUXE Diamond Difference foundation had advanced light-refracting ingredients that deliver a luminous, ageless complexion. Each Luxe essential is formulated with Diamond Powder Technology and specialized moisturizing agents -enveloping skin in a feather light veil that instantly boosts brightness and blurs imperfections. Luxe Liquid Foundation SPF 18 has the light-refracting power of diamonds to bend light for a soft, ageless complexion with glo inerals Luxe Liqued Foundation. Luxe Liquid Bright Concealer is a lightweight, corrective concealer pen that provides impeccable coverage while bringing light and brightness t the conplexion. Reduces signs of aging, fatigue and shadows by canceling out unwanted color and masking imperfections. Softens the look of fine lines and improves skin’s radiance. Luxe Setting Powder is a luxurious loose powder to set Luxe Liquid Found and blur the fine lines and imprefections for a soft focus affect on the skin. Provides weightless coverage with a sheer, sikly smooth finish to leave skin looking flawless. Luxe Foundation Brush is a flat top kabuki applicator to be used with the Luxe Liquid Foundation. Gives a smooth powdery finish. Luxe Setting Powder Brush is designed with Luxe Setting Powder in mind. This soft tulip brush allows for delicate loose powder application. The tapered part of the brush allows for precise placement of product. Glo-minerals Makeup Brush Tools are offered at Indulge Salon.